This photo pretty much sums up December 2007 for me and gives you an idea why I got so behind in updating and communicating about what was going on with the film. 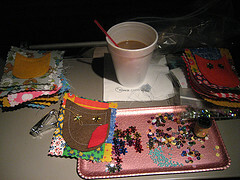 This is my airplane tray flying from Milwaukee to Boston. I was trying to catch up on my wholesale orders for Flying Fish Design & have stuff to sell at the craft fairs we were shooting at. This winter was insane and let me tell you it's all about nail clipper's to sew on the air plane since you can't have scissors!! Over the last 7 months of shooting we traveled over 19,000 miles to document the craft community. OVER 19,000! Micaela & I have opposite sleeping schedules so I watched a lot of late night TV. Boston is the worst city I've ever gotten lost in. I had to take a good 2-3 weeks off after the Holiday's or else I was going to crash and burn, loosing all motivation along with me. So I did, and it took me about a month and a half to catch up with updating everything after that break. Now everything from flickr, etsy and myspace is all up to date (fingers crossed). Our biggest and most important news is that we found an editor to work with locally who will be cutting a trailer, this means there will be something for you all to see in the next few months!! This is super duper exciting for me to b e taking the next step forward. I will be posting when we start to work on that process. The flickr account is updated with all of our travel photos from December. Pictures from Seattle, LA, Boston, Providence and more. You can see photos of who we interviewed including Nikki McClure, Tracy Bull, Leah Kramer and many more. The ETSY shop has been updated with tons of new stuff (including the unisex T-Shirt that was requested) and we are having a WINTER SALE!! And, check out this great write up about the documentary on Wickedly Chic from this week! It's really good to be home. In the snow. In Milwaukee. We will be shooting in Madison and Milwaukee over the next month as well as flying out to the Craft Congress in Pittsburgh, PA at the end of March. Thanks to everyone who made this past 6 months of shooting a possibality. We are moving forward and getting ready to dive into editing. Traveling + the holidays was a serious combo that hindered updates in internet land. 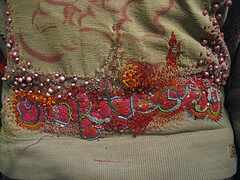 Today I am working on updating the photos on flickr and also uploading new work to the etsy shop!